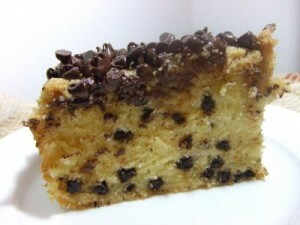 Choco Chip Cake recipe by Sidrah And Sehar at DesiRecipes.com. 3-4 tblsp of any jam of choice. Put the oven on gas mark 9 or 200c. Put flour, sugar, butter, eggs, baking powder and vanilla assence into a bowl. Mix the mixture with a electric wisk for about 45 minutes. Then add the choco chips and mix them together. Pour the mixture into a 21" cake tin. The mixture will fit in two of those tin. Put the mixture in the oven. Bake for 20-25 minutes until light. When the cake is cool spread the jam on top of both cakes and put them on top of each other.